East River Commedia will present “The Magnificent Cuckold” (Le Cocu magnifique), the astonishing classic farce written in 1920 by the Franco-Belgian playwright Fernand Crommelynck, at the Connelly Theater, 220 East 4th Street, from September 14 to October 6 to debut a lively new translation by Ben Sonnenberg and Amiel Melnick. Paul Bargetto, Artistic Director, will direct the piece. 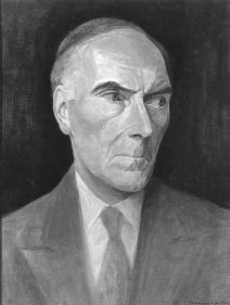 Crommelynck (1886-1970) was among the most celebrated playwrights of his time, known for farces in which commonplace weaknesses are developed into monumental obsessions. “The Magnificent Cuckold” lives today primarily in the long shadow of Meyerhold’s famous biomechanical production of 1922, a radical adaptation that made the play famous but partially accounts for why it is seldom attempted today. East River Commedia, with its emphasis on international theater and its expertise in gestural theater, aims to rediscover this overlooked masterpiece with an approach that is primarily farcical. Portrait of Fernand Crommelynck, displayed at the Royal Museum of Fine Arts of Belgium in Brussels. Painted by Albert Crommelynck between 19021933. The play is a penetrating study of sexual jealousy. Its protagonist is a young man whose inability to calm his suspicions about his wife’s fidelity makes him force her to betray him–she must do so in front of him, and with the whole village. Bruno, the village scribe, is married to a beautiful and utterly devoted young woman named Stella. He makes a good living composing love letters for the uneducated villagers, many of which are addressed to his wife. He is also the kind of man whose eloquence can lift him off into rhapsodies of brilliant exaggeration. As a character verging on the manic, his paranoia is easily excited. Bruno convinces himself that his fear of being cuckolded can be appeased only by the certainty of knowing he is a cuckold. Therefore, he offers his wife first to his best friend and then, when that fails to appease him, to all the young men of the village. This demented decision disrupts village life: the town turns violently against him and the women of the village with torture, degradation and expulsion threaten Stella. 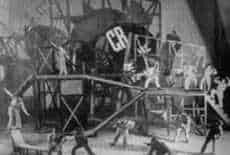 Meyerhold’s 1922 performance of The Magnificent Cuckold. Photo from www.northwestern.edu. Crommelynck’s excesses were entirely in line with his theme: that love is not far from jealousy, nor is passion from mania. These extremities reflected the context in which the play was written, only two years after WWI and the flu pandemic of 1918. It was a post-apocalyptic time, bursting with artistic invention (Dada, Surrealism, Absurdism, Futurism, and more), yet overshadowed by threats of totalitarianism and economic crisis. Director Paul Bargetto contends that although our present world is not quite that of the play, a pervasive sense of dread still afflicts us, making the play pertinent to our time. According to co-translator Ben Sonnenberg, the play is quite unlike any other farce of the period, being at the same time realistic and farcical. It is actually a tragedy in farcical form. In the mantle of farce, it presents unimaginable cruelty in a domestic situation. (Farce, Sonnenberg notes, has often been described as speeded-up tragedy.) It also draws connections between paranoia, neuroses and homosexuality that have made it a favored resource for doctoral dissertations. These heady considerations aside, the play is wonderfully theatrical. The characters punish each other like Punch and Judy, speaking in a combination of burly everyday speech and lyrical prose reminiscent of Jean Genet. The production will employ a fusion of presentational and naturalistic acting styles, in what has become the “signature” style of East River Commedia, which uses the entire body as an expressive tool without giving up the subtleties of textual analysis, character and psychology. There will be an original score by award-winning composer Nico Muhly. The design draws upon works of James Ensor, the Flemish painter who’s grotesque, leering figures show terror in the gaiety of crowds, Duchamp, and Louise Bourgeois. Troy Lavallee, winner of the 2005 New York IT Awards for Best Actor, plays Bruno. The cast also includes Morgan Lynch, Tuomas Hiltunen*, Reet Roos Varnik, Jeffrey Woodard*, Jorge Rubio, Eric Dean Scott*, Laura Wickens*, Meredith Napolitano, Joe Sevier, Dan Cozzens, Max Woertendyke, Jessica Bates, Ishah Janssen-Faith, Ashley Avis and Kayla Lian (*indicates member of Actors Equity Association). Set Design is by Mimi Lien. Costume Design is by Amanda Bujak. Composer is Nico Muhly. Lighting Design is by Tim Cryan. East River Commedia, under the direction of Paul Bargetto, came to prominence with its productions of plays by Slawomir Mrozek: “Striptease” and “Out at Sea” (La MaMa, 2002) and “Serenade” and “Philosopher Fox” (Collective:Unconscious, 2005; National Theater of Constanta, Romania, 2006). Past productions also include “Hecuba” by Euripides in Turkey, “The Taming of the Shrew” at National Theater of Constanta, Bucharest, “Necessary Monsters” with National Performance Network, “A Midsummer Night’s Dream” at Riverside Church, and plays by Dante, Rozewicz, Strindberg and Witkiewicz. Reviewing “Striptease” and “Out to Sea,” The New York Times (Margo Jefferson) wrote, “Paul Bargetto directs with a keen sense of this visual truth; the truth of cartoons on the page, and of commedia on the stage.” In the first Innovative Theater Awards in 2005, East River Commedia’s “Serenade and Philosopher Fox” won Outstanding Production of a Play, Outstanding Actor in a Lead Role (for Troy Lavallee) and Outstanding Director (for Paul Bargetto). Composer Nico Muhly, Translator Amiel Melnick, set designer Mimi Lien and leading actor Troy Lavalee, as well as most of the cast, are company members. The translation is by Ben Sonnenberg and Amiel Melnick. Ben Sonnenberg started the magazine Grand Street in 1982 and gave it up in 1991. He has translated several plays from French, including Musset’s “The Firescreen” (Le Chandelier) and Eugene Labiche’s “The Three-Figure Man” (Celimar le Bien-Aime). His memoir “Lost Property: Memoirs and Confessions of a Bad Boy,” has been reprinted by Counterpoint. Amiel Melnick has translated Marivaux’s “L’Ile des Esclaves” (HERE, 2004). Her critical writing has been published in Pluriel 12, Africultures and Slavic and East European Performance Studies Journal. She recently returned from Fulbright fellowship in Slovenia where she worked as an assistant dramaturg in the National Theater, and will begin doctoral studies in Anthropology in fall of 2007. The pair have other projects in progress, but this is their first collaboration to make it to the stage. The show will run September 14 through October 6 at the Connelly Theater, 220 East 4th Street (between Avenues A & B) at 7:30 pm. The running time is 2:30 with intermission.